William Dyce, Scottish painter, designer, and administrator, born on 19 September 1806 in Aberdeen was the son of Dr. William Dyce of Fonthill and Cuttlehill FRSE (1770–1835) and Margaret Chalmers of Westburn (1776–1856). His father was also a fellow of the Royal Society, a physician of some repute. Dyce went to Marischal College and at the age of 16, he got his MA degree. Afterward, when he gained his interest in design, Dyce enrolled in the Royal Scottish Academy in Edinburgh in 1825. 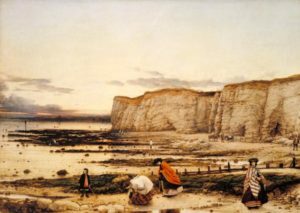 Pre Raphaelite Brotherhood was then a new kind of radical art and Dyce was connected to it. It was related to glorifying the values of simple but more beautiful past. Initially, he was a successful conventional artist in Edinburgh. In 1820 Dyce visited Italy twice and he got influenced by a group of German artists called the Nazarenes and shifted to being a Renaissance Artist. The goal of the Nazarenes was to bring back the spirituality in Christian Art. This is a depiction of Jesus Christ by William Dyce, meditating at the time of his fast of forty days and nights in the Judaean Desert. Sitting silently on a rock bench, his eyes closed and head facing downwards, Jesus is strongly isolated from the rest of the world. After the following travels, he settled for several years in Edinburgh. He then supported himself by painting portraits at first but soon took to other subjects of art especially the religious subjects he always preferred. In 1835 he got elected as an associate of Royal Scottish Academy. His first teaching appointment was at the Trustees Academy in Edinburgh which he never took up. Dyce, with another artist, Charles Heath Wilson, approached the board of Trustees for Manufactures in 1837 and proposed for starting two additional classes of art. The board appointed them on fairly low salaries. Dyce was asked by the Board to prepare a formal scheme for two new schools. He mentioned that the students should learn painting and pictorial decorations with reference to the history and progressive changes. Later spending a considerable period in Edinburgh, Dyce was given charge of the School of Design in Edinburgh and was then invited to London where he was based thereafter to head the newly established Government School of Design, later called The Royal College of Art. The name pretty much-befitting post-Dyce’s contribution to it. Getting to Dyce’s contribution, he was nevertheless known for his contribution as the founder of the Motett Society (1840–1852), which sought to advance the restoration and liturgical use of long-neglected works of the English church. Speaking of the Motett Society, he founded the society for the revival of ancient church-music. Appointed as a professor of fine art in King’s College, London, he delivered a remarkable lecture “The theory of fine art”. Stumbling upon William Dyce’s legacy we can sum all of it up by quoting that Dyce was actually an elegant scholar in more ways than one. He obtained the Blackwell prize at Aberdeen for an essay on animal magnetism in 1828. Later in 1843-1844, he published an edition of the Book of Common Prayer with a dissertation on Gregorian music and its adaptation to English words. Dyce got married to Jane, daughter of Mr. James Brand in January 1850 and lost his life on 14 February 1864 in Steatham leaving two sons and two daughters. Dyce was one of the most learned and accomplished British painter, one of the highest in aim, and most consistently self-respecting in workmanship. However, there is, in Dyce’s work more of earnestness, right conception and grave, sensitive, but rather restricted powers of realization than of authentic greatness. 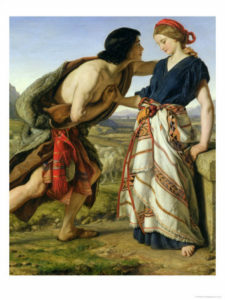 William Dyce from the conception of his creative part has gifted society with his fine piece of art until the society was content. A few other famous works include, The Infant Hercules (1824), Madonna and Child (1827), James Hamilton (1832), Saint Catherine (1840), Saint John Leading Home His Adopted Mother (1842), King Lear and The Fool in The Storm (1851), Man of Sorrows (1860). His last article in relation to his own art was published in 1853, The National Gallery: It’s formation and management. If we ever sit still to go through all his works, to our surprise there would be paintings which don’t even have a specific year to tell us as to when they were even painted, i.e., A Draped Figure, Cottage Interior, Girl at a Casement, etc.